Depicted with bright colourful stars on its hull, the fun and friendly Norwegian Star offers a choice of 15 tempting dining options, 11 exciting bars and lounges, a fitness centre & spa plus casino, pools and much more. Your accommodation choices are just as varied with a room or suite for your needs, your family and your budget. Dining is a delight aboard Norwegian Dawn. It is sociable, relaxed, fun, and most of all fresh and flavoursome with lots of variety. Treat yourself or treat someone special; you’ll find great gemstones and watches at duty-free prices plus stylish accessories. Variety, choice and a place for everyone is what you'll discover when seeking that perfect place to get a pick-me-up aboard Norwegian Star. Holiday-time is you-time and that gives you license to indulge your mind, body and spirit. Relax by one of the pools, indulge in a spa treatment or find a new book in the tranquillity of the Library or Card Room. Norwegian Star has compiled a tick-list of kids' favourites with slides, rockets, video games and sports to ensure that Mum & Dad get some peace! There are comedies, magic and full musical productions for your delight aboard Norwegian Star. Check out the schedule as you'll not want to miss a single one. Children will love this vast two-storey facility especially created for 3 to 12-year olds. Alongside the Thermal Suite is an indoor lap pool which is just the ticket if you enjoy clocking up a few laps on a daily basis. As the name would suggest this bar celebrates the fact that somewhere in the world it is 5 o'clock - happy hour! The bar enjoys the sounds of the tropics and as the sun sets becomes lively with great music and dancing on the waterfront. When you're in the mood for great entertainment, the huge two-storey, Stardust Theatre is home to exceptional performances, check out the programme when you get aboard. Keep fit at the Barong Fitness Centre which includes treadmills, ellipticals and free weights in addition to daily aerobics classes. One of the ship's main dining rooms, this elegant, traditional restaurant serves your favourite international cuisine just as you like it. A must for all chocolate fans is the Chocoholic Night which is offered once per sailing and is a chocolate indulgence beyond words. Healthy treats are just what you deserve after a vigorous workout; choose from a wide selection no juices and smoothies. Enjoy the finest Asian cuisine in comfortable surroundings where fresh noodles, soups and tasty wok dishes are just part of what's on offer. This casual indoor buffet features international favourites and has an additional area that specialises in fare for the children. A full-size court where you can play basketball, volleyball and tennis making friends and having fun. A mouth-watering Brazilian-style dining concept which sees grilled and slow-roasted meats carved tableside, professional ‘Passadores’ stopping by your table with succulent meat on skewers and a Moderno Signature Salad display. You will have the opportunity to signal ‘no more’ to your waiter which may be very useful! Savour American classics in a friendly Irish pub atmosphere. You'll find fish & chips as well as chicken pot pie on the menu as well as prime ribs, chicken and waffles. With beer on tap, a 2-storey TV screen, billiards and darts you'll always find a warm welcome and a pal to chat to. Whatever you forgot to pack or suddenly find you need, there's a good chance of finding it in this useful shop. With a rocket theme, this inviting pool has slides, a paddling pool and nearby hot tub. For favourite casino games such as Blackjack, Craps, Roulette & Let it Ride, Dawn Club Casino will make it welcoming and fun, especially if this is your first visit to a casino. The casino bar has all your favourite drinks and cocktails as well as Champagne to toast your win! You are unlikely to be too far away from a pool in which to swim, The Oasis Pool with its slides is fun whatever your age, and it is conveniently flanked by a pool bar and ice cream bar. If it's laps that you're looking to clock up then the ship's lap pool and is the longest indoor pool on a cruise ship so problem solved. 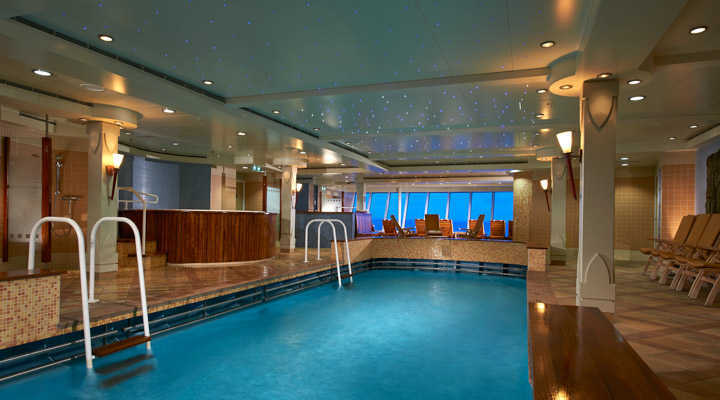 You will also find six hot tubs conveniently located throughout the ship. Teenagers are encouraged to hang out with friends at the coolest lounge onboard. This club has a video, jukebox, foosball table and air hockey. At night it becomes a teen disco. The Norwegian production cast and show orchestra join to bring you the hottest music of the 70s. If you love a club that plays tunes by artists like Donna Summer, Styx and Queen then this is where you'll want to be. Reflecting the grandeur of the outrageously opulent Palace of Versailles outside Paris, this plush dining room offers contemporary cuisine including chef's signature dishes. Visit the wine cellar to sample worldwide wines with an option to buy if they take your fancy. Enjoy a great choice of Champagne in this comfortable art-deco inspired bar. Situated in the middle of the buzzing Atrium is the perfect place to linger and people watch, cocktail or coffee in hand. 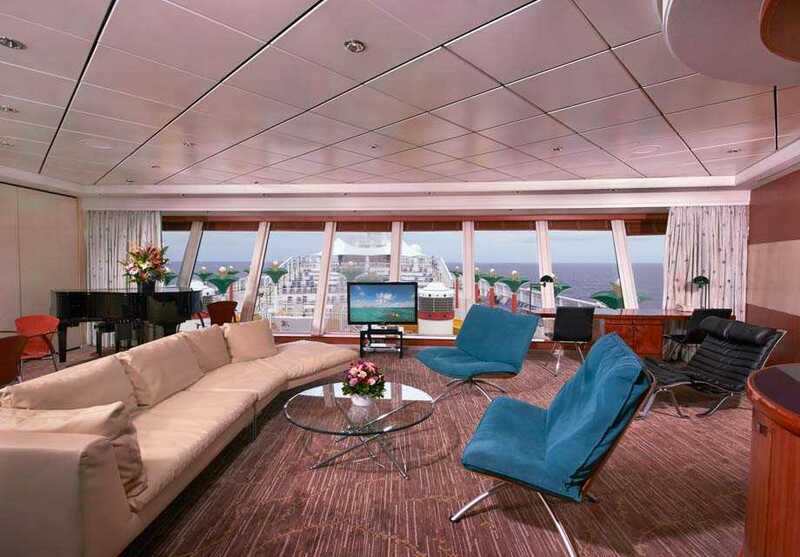 This grand space offers three-deck vertical views and a two-story Wii wall. A real Bavarian atmosphere abounds on the Bier Garten deck; authentic German beers, bratwurst and sauerkraut are just a few items to entice you to visit. Get your white-only glad-rags on and head to the pool deck for a glowing party where you can dance the night away with white-winged angels. Drink, chat or dance the night away in this cool, relaxed bar. Drop by the video arcade on Deck 13 if you think it's time you captured aliens, raced a car or challenge yourself to pinball. Spinnaker Lounge has so much to offer; windows in the floor for a view of the bridge, a stage that converts to a dance floor and views of the wonderful ocean through external windows. Located poolside at the Oasis Pool, this bright outdoor bar is close to hot tubs and Sprinkles Ice Cream Bar. If you want to indulge your sweet tooth then this is the stop for you. Banks of computers are set up for your convenience in the Internet Café. Golfers need not suffer withdrawal symptoms aboard the Norwegian Spirit, take your position on one of two golf driving nets and swing away. This energetic production includes magic, acrobatics, pulsating music and with dazzle from start to finish. Based on the four elements of earth, air, water and fires this spectacular is a family crowd-pleaser. This large, department style store stocks essentials you may have forgotten as well as treats and gifts that you'd like to browse. Join like-minded voyagers on your walks or jogs around the ship's decks. Tricks of the trade, magician style. Witness fun magical shows and a dash of comedy. At this stylish shop, you will find the latest fashion statements, jewellery, fun accessories and handbags. Brands such as Nautica, USPA and Quick Silver are all represented as are women’s wear leaders Guess, and Roxy. If you love rolling in stones then Colombian Emeralds International will have just the gem you are looking for. At duty-free prices, you'll find emeralds, rubies, diamonds and sapphires as well as branded time-pieces. A charming environment with plenty of travel-related reading, enjoy calm reading time with like-minded voyagers. This traditional sushi bar prepares and serves authentic cuisine in front of your table. Select from compact and convenient to family friendly. There is a stateroom or suite for everyone; decide what is important to you in your accommodation and where on the ship you would rather be. This suite sleeps up to five guests and offers great family space with a main double bedroom plus children's bedroom, living and dining area and large balcony. These suites benefit from butler and concierge services. Accommodating up to 7 guests this spacious suite has 3 bedrooms each with a king or queen size bed and luxury bathroom with shower. There is a central living and dining room plus a private garden with hot tub, outdoor dining area and terrace. These suites benefit from butler and concierge services. With floor-to-ceiling glass doors that open onto your private balcony these stylish, modern rooms include attractive appointments. There are two lower beds that convert into a queen-size bed plus a pull-out sofa. The room is aft-facing giving great views. This romantic suite sleeps up to four and has a bedroom with queen size bed, luxury bath and shower, living area, dining area and large balcony. These suites benefit from butler and concierge services. 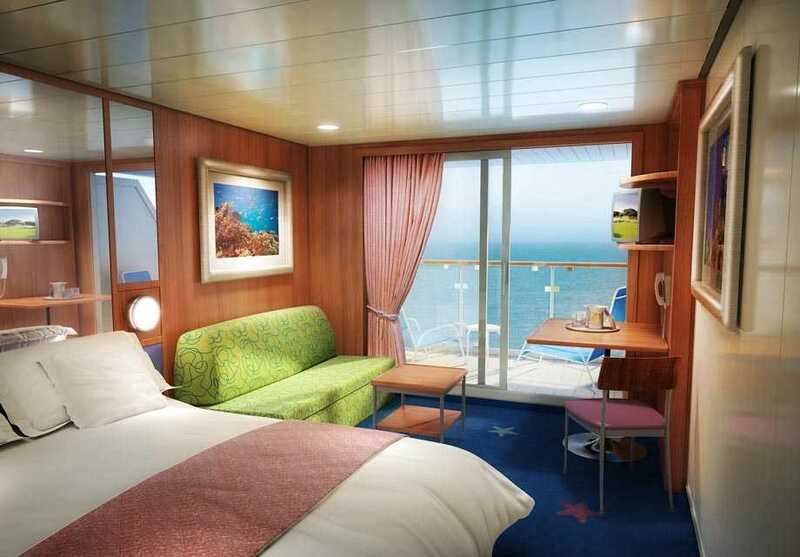 These Staterooms have a balcony and two lower beds that convert into a queen-size bed; there also sitting area with pull-out sofa. The balcony is accessed via floor-to-ceiling glass doors and the bathroom has a shower, sink and WC. This suite sleeps up to six guests and offers exceptional comfort with a living room, dining room, bedroom with king size bed plus some with a separate children's bedroom. There is also a convertible sofa, luxury bathroom with whirlpool tub and a huge bank of floor-to-ceiling windows. These suites benefit from butler and concierge services. These family Balcony Staterooms with balcony, have two lower beds that convert to a queen size bed and a sitting area with sofa bed. A bathroom with shower, sink and WC. This affordable family option features two lower beds that convert to a queen size bed and additional bedding for up to two more. The door opens to the centre interior corridor. 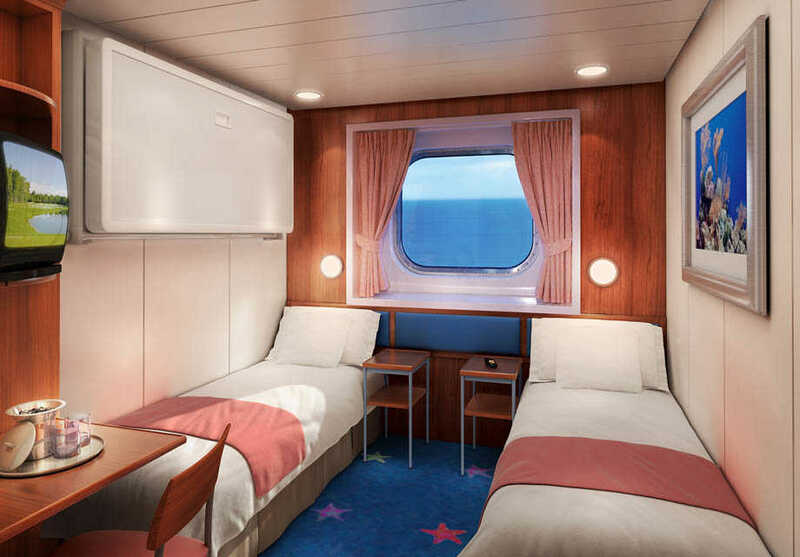 These Staterooms with picture windows are perfect for families with two lower beds that convert to a queen size bed, a restroom with shower and additional bedding so that four guests can be accommodated. Sleeping up to six, this ideal family accommodation features a queen size bed that converts into two lower beds, a sofa bed and additional bedding for two more. There is a central living and dining area plus a luxury bathroom with shower. This suite benefits from butler and concierge services. Situated on lower decks these inside staterooms situated mid-ship two lower beds that convert to a queen size bed and additional bedding for up to two more. The door opens to the centre interior corridor. 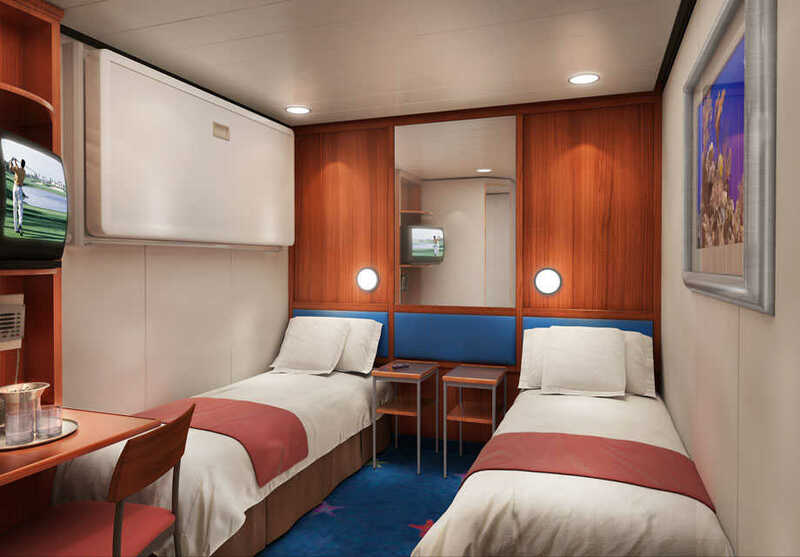 These mid-ship Staterooms have a balcony and two lower beds that convert into a queen-size bed; there also sitting area with pull-out sofa. The balcony is accessed via floor-to-ceiling glass doors and the bathroom has a shower, sink and WC. 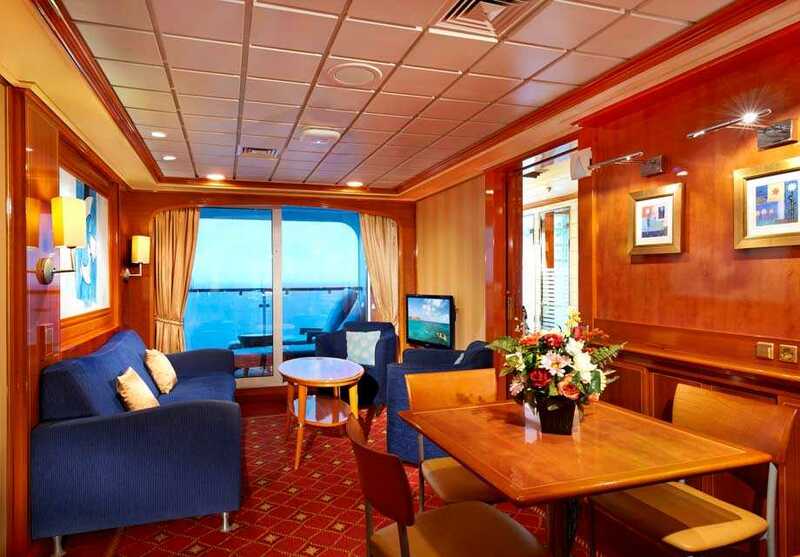 A Guarantee Stateroom assures you that you will be allocated a Mini-Suite stateroom or better. Your view may be partially or fully obstructed, porthole or window and may be located on any deck. It will be assigned up to one day before embarkation. 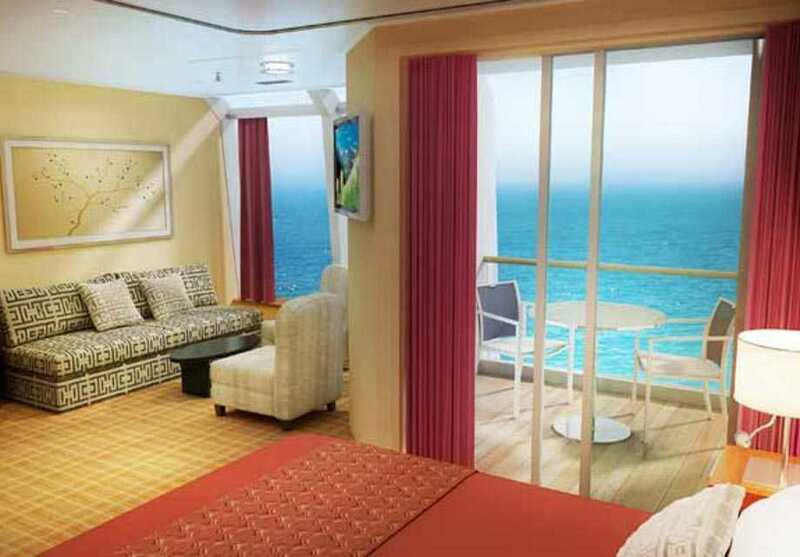 A Guarantee Stateroom assures you that you will be allocated an Oceanview stateroom or better. Your view may be partially or fully obstructed, porthole or window and may be located on any deck. It will be assigned up to one day before embarkation. 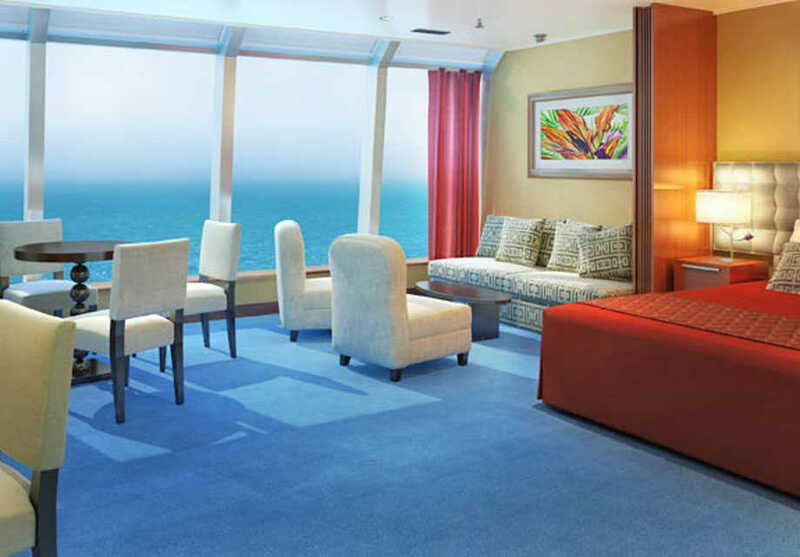 A Guarantee Stateroom assures you that you will be allocated a Balcony stateroom or better. Your view may be partially or fully obstructed, porthole or window and may be located on any deck. It will be assigned up to one day before embarkation. 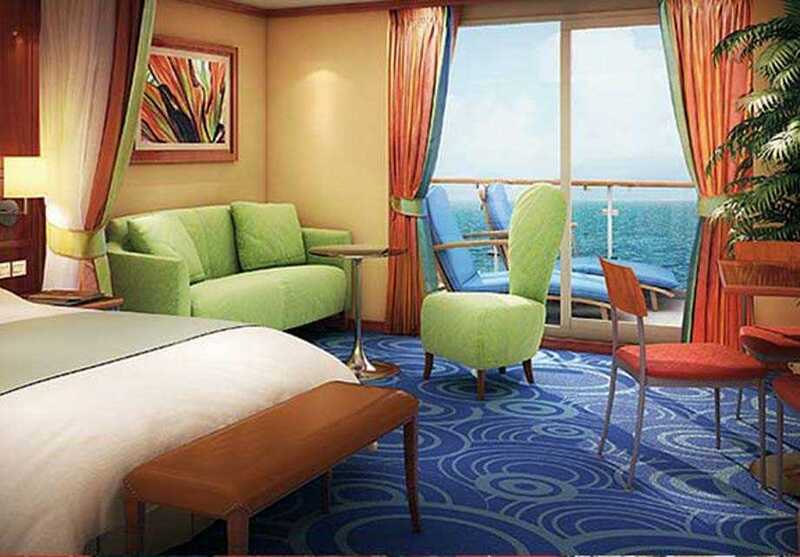 A Guarantee Stateroom assures you that you will be allocated an Inside stateroom or better. Your view may be partially or fully obstructed, porthole or window and may be located on any deck. It will be assigned up to one day before embarkation. 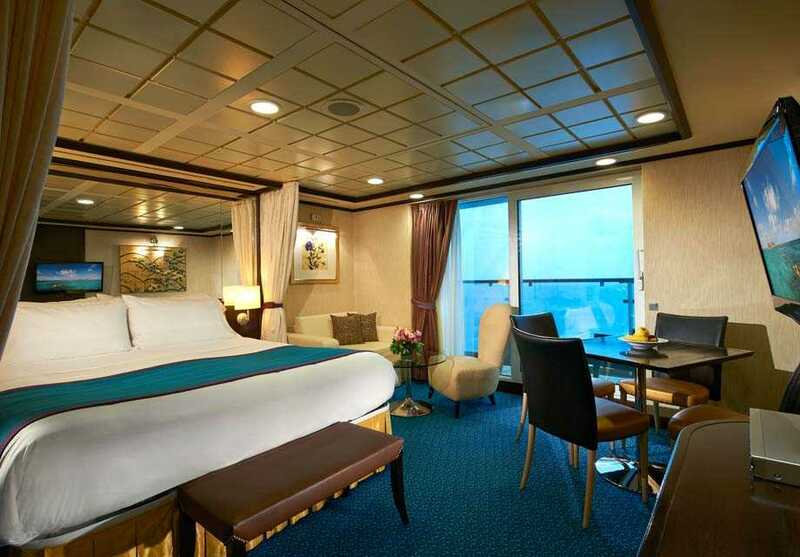 Situated close to the dining and activity areas of the ship this mid-ship Stateroom with balcony features two lower beds that convert to a queen size bed and a sitting area with sofa bed. These centrally positioned Staterooms with porthole have two lower beds that convert to a queen size bed, a bathroom with shower and sink and WC plus additional bedding for up to 2 more. These centrally positioned Staterooms have two lower beds that convert to a queen size bed, a bathroom with shower and sink and WC. These Staterooms with either porthole or window have obstructed ocean views, two lower beds that convert to a queen size bed, a bathroom with shower and sink and WC plus additional bedding for up to 2 more. 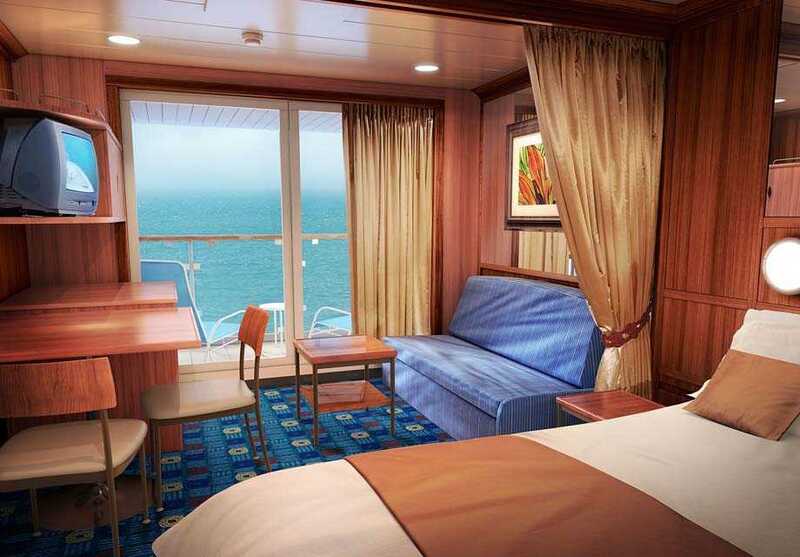 These Staterooms have two lower beds that convert to a queen size bed, a bathroom with shower and sink and WC. 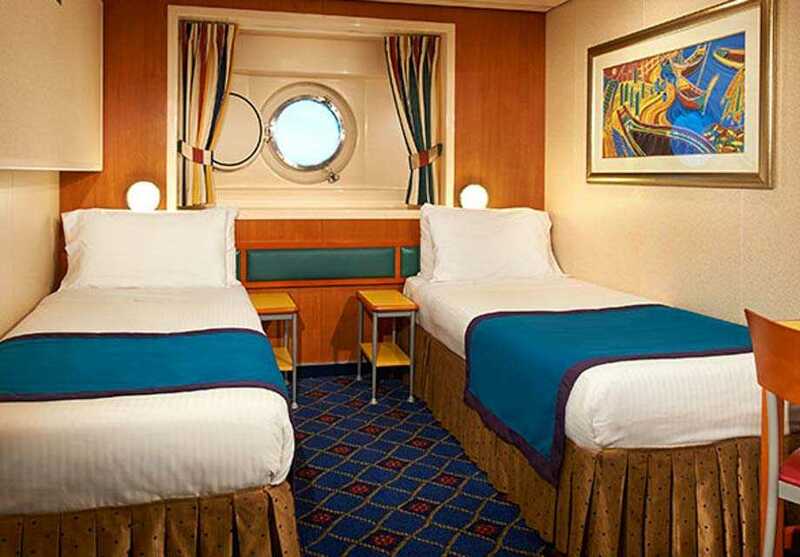 These Staterooms with porthole have two lower beds that convert to a queen size bed, a bathroom with shower and sink and WC plus additional bedding for up to 2 more. This suite sleeps up to four guests and offers exceptional comfort with a living room, dining room, bedroom with king-size bed plus some with a separate children's bedroom. There is also a convertible sofa, luxury bathroom with whirlpool tub and a huge bank of floor-to-ceiling windows. These suites benefit from butler and concierge services. This suite sleeps up to four and has a bedroom with queen size bed, luxury bath and shower, living area, dining area and large balcony. These suites benefit from butler and concierge services. This suite sleeps up to four and has a bedroom with queen size bed, luxury bath and shower, living area, dining area and balcony. These suites benefit from butler and concierge services.